On April 11, 2019, the first session of the 14th Supreme People’s Assembly (SPA, the DPRK’s Parliament) convened at the Mansudae Assembly Hall in Pyongyang. Such meetings take place annually in spring, usually before the highest holiday in North Korea, the “Day of the Sun,” which is celebrated on April 15 and commemorates the birthday of the country’s founder Kim Il Sung. Thus, neither the parliamentary session nor its timing this year were particularly extraordinary. However, there were some notable aspects to the 2019 SPA session. First, it was the first session convened of the newly elected parliament (elections were just held in early March). Additionally, it is the first session held since Kim Jong Un participated in two DPRK-US summits (June 2018 and February 2019), and two inter-Korean summits (April and September 2018). Keep in mind SPA sessions are rare occasions when North Korea issues official statistical data on its economy through the Budget Report, and when it reveals strategic trends and decisions. The Korean Workers’ Party is still firmly in control of state affairs. The elevation of Kim Jong Un to the status of the supreme representative of all Korean people is a confirmation of the North’s desire to accomplish Korean unification under its leadership, and constitutes an open challenge to South Korea. The actual rate of economic growth has reached its lowest value since 2006. Growth expectations for the coming fiscal year are moderately optimistic. Fiscal discipline seems to have improved, although there is a built-in expectation that the plan is over-fulfilled. In contrast to its prominence in the last two years, the Five-Year Development Plan has been mentioned only once in the Korean versions of the speeches of the prime minister and the minister of finance, respectively. Along with the omnipresent ideological focus on “self-reliance” and the low expectations regarding revenue from special economic zones, this points at some kind of economic difficulties which are at least in part likely related to economic sanctions. The state will invest in a project that emphasizes comradeship-in-arms with China. This confirms the impression of a strongly improved bilateral relationship and strengthens the argument that China is supposed to serve as a backup option for Pyongyang if talks with the US on lifting the sanctions fail. The share and growth of revenue from local sources is projected to be stagnant. This could be a sign that economic reforms leading to decentralization have come to a stop, at least for the time being. Similar to last year, this year’s SPA session was preceded by Korean Workers’ Party meetings: A Politburo meeting on April 9, and a Party Plenum on April 10. Kim Jong Un thus continued his approach of demonstrating the power of the Party over state affairs very clearly. As the state media reported, the State Budget Report was discussed and approved at the Politburo meeting before it was delivered at the SPA session on April 11. This corresponds with observations made since Kim Jong Un had first been introduced to the public during a Party Conference in autumn of 2010. When Kim Jong Il passed away, it was the Party who declared Kim Jong Un to be the “great successor.” The 2019 SPA session and its preparations provided no indication that this line will be changed anytime soon. This stands in contrast to what had happened under Kim Jong Il who reduced the public role of the party in the context of his military first policy. It was not a surprise that Kim Jong Un was again elected as the chairman of the State Affairs Commission, which according to the current DPRK Constitution, makes him the supreme leader of the country. But there were some major personnel shifts during the 2019 SPA session, such as the replacement of the prime minister and of the president of the Presidium of the SPA. The latter is often called the titular head of state. The position had been held for over 20 years by Kim Yong Nam, who as of 2019, is 91 years old and thus most likely retired because of age. His function has been taken over by Choe Ryong Hae, who holds a number of other powerful positions in the Party and the military. The replacement of Prime Minister Pak Pong Ju by Kim Jae Ryong, a high-ranking Party member, is also unlikely to be a purge, since the 80-year-old Pak at the same session was appointed as vice chairman of the State Affairs Commission and also holds the position of vice chairman of the Central Committee of the Party. The prime minister is typically responsible for managing the economy, so it remains to be seen whether Kim Jae Ryong will create any new impulse, possibly towards more reforms. However, it is very likely that diplomatic problems will emerge from the fact that Choe Ryong Hae was sanctioned by the US in late 2018 over human rights abuses. Depending on how the US decides to implement that decision, this could limit the way Choe can interact with the international community as head of state, and vice versa. A political bombshell was dropped in the first speech of the newly promoted Choe Ryong Hae, in which he declared that Kim Jong Un, by being the chairman of the State Affairs Commission, also is “the supreme representative of all the Korean people” (조선인민의 최고대표자). The actual goals and attitude notwithstanding, North Korea has so far been relatively careful to avoid open claims to leadership over all of the Korean Peninsula. While Article 1 of the Constitution says that the DPRK represents “the interests of all the Korean people,” Article 9 adds that the complete victory of socialism is to be achieved “in the northern half of Korea” only. The new title is thus a certain break with the past and openly challenges the role of South Korea and its president. The claim to be the leader of all Koreans does, in fact, correspond with the major long-term strategic goal of Kim Jong Un to achieve a unification of the Korean Peninsula under his leadership. However, it is unclear why he decided to make this so explicit now, and why he has chosen to create such a huge challenge to ROK President Moon Jae-in despite the current status of the bilateral relationship between the DPRK and the US after the Hanoi Summit. It seems that despite the abrupt end of the summit, Kim Jong Un feels very confident that he does not need Moon’s help as a mediator anymore. He either believes that his relationship with President Trump is still strong, or he found a strong partner such as China to pursue his political goals through other channels. His 2019 New Year’s speech provided a hint into the latter direction. It is possible that a so far unspecified “ordinance of the SPA on modifying and supplementing the Socialist Constitution of the DPRK” as reported in Rodong Sinmun on April 11, 2019, is related to this claim. To start with a disclaimer: For security reasons, North Korea is very reluctant to share hard facts on its economy. Therefore, doubts are in place regarding the accuracy of any numbers being published. It is not advisable to take any absolute numbers or growth rates at face value. However, if we assume that the error margin—resulting from deliberate adjustment of the numbers and/or differing accounting standards—is relatively stable over time, a comparative analysis of this kind of data can provide clues on development trends. The budget report was, like in 2018, delivered by Minister of Finance Ki Kwang Ho. At the beginning of his speech, he mentioned the Five-Year Development Plan (５개년전략), but he does so only very briefly. Given the prominence of this topic in the previous years, this is noteworthy. Interestingly, the English translation of the budget report does not include any reference to the plan. The rate of growth of state budgetary revenue, which I treat as a proxy for an official GDP growth rate, was given as 4.6 percent during the last year, indicating a moderate growth of the economy but being lower than the 4.9 percent reported in 2018, and actually the lowest such value since 2006. This corresponds with Western reports on sanctions, especially those issued since 2017, having an impact on North Korea’s economy. Figure 1 shows the year-on-year growth figures of the last almost two decades in comparison to the values for the previous years. Figure 1. 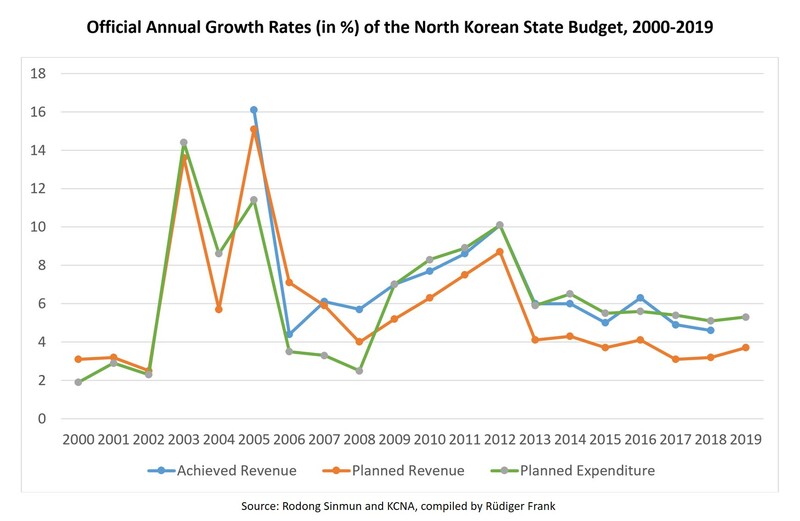 Annual growth rates of North Korea’s state budget, 2000~2019. We find that growth rates and expectations continue to be relatively modest if compared to the upbeat mode during the reform period 2002-2005 and the final years of Kim Jong Il. The new modesty started around 2012/2013. It remains to be seen how long it will last; Kim Jong Un announced a focus on the economy in 2018, which should at some point be reflected in growth rates. So far, North Korea’s economic planners still seem to be somewhat careful. The projected growth figure (“planned revenue”) for 2019 is 3.7 percent, which is only slightly (+0.5) higher than last year. The same is true for “planned expenditure,” which is set to grow 5.3 percent, or +0.2 over what was projected in 2018. With all due caution, we can thus see signs of a moderate optimism. As Figure 1 shows, the North Korean state has since 2008 planned to spend more than it earned. The gap between the planned growth of revenue and expenditure for 2019 continued to narrow and is now at 1.6 percent (2018: 2.1 percent). This can be interpreted as a sign of increasing fiscal discipline. In general, higher growth rates for expenditure over revenue are not a sign of deliberate deficit spending since the figures for actual, or “achieved” revenue are usually higher than planned and thus lead to a more balanced budget and occasionally even a small surplus, at least according to the official figures. Figure 2. 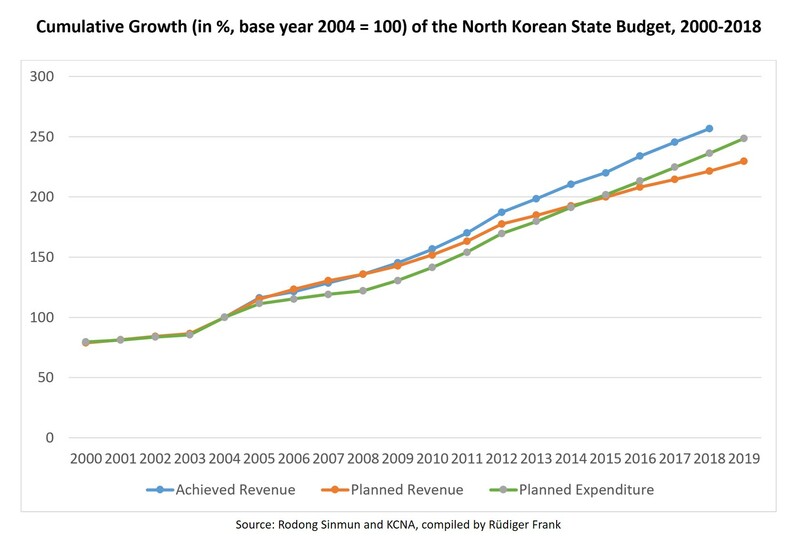 Cumulative growth rates of North Korea’s state budget, 2000~2019 (base year: 2004=100). To further illustrate the point on fiscal soundness, Figure 2 shows that the cumulative value for achieved revenue (blue curve) has constantly been above cumulative expenditure growth (green curve) throughout Kim Jong Un’s tenure. Since 2013, however, the green curve for cumulative expenditure has been above the orange planned revenue curve. This indicates the built-in expectation that the plan will be over-fulfilled. The latter is a somewhat alarming sign. It either implies the setting of deliberately low goals, or of a risky betting on the future. Aside from these macroeconomic indicators, the budget report provided a few detailed insights into North Korea’s economic development and strategy. The key ideological term throughout the report is “self-reliance” (자력갱생). This is not necessarily a deliberately chosen strategy; the focus on domestic resources and the goal of minimizing external inputs corresponds with the various economic sanctions. North Korea has been known to pursue such a policy of minimal external dependency for decades, so it would be unsound to hold the latest sanctions responsible. Nevertheless, it seems that they have enforced this strategy, which in their final consequence makes North Korea less of a stakeholder of cooperative international relations. A country that does not need partners is less likely to respond to their wishes. Against this background, it is noteworthy that revenue from special economic zones is expected to grow only 1.6 percent in 2019. In 2018, this value was 2.5 percent. No matter how much they would appreciate it: after all the summits of 2018 and 2019, North Korea’s economic planners do not seem to expect much of an inflow of foreign direct investment into their country this year. A remarkable detail in the budget report concerns the reconstruction of the “Hall of Great Leaders and Comrades-in-Arms” in the Korean Revolution Museum. This is a reference to the Korean War, when the North Koreans and the Chinese jointly fought against a US-led UN coalition. Considering the growing competition between the US and China in the context of what we could call a coming Cold War 2.0, and the decreasing optimism regarding a bilateral solution in the talks between North Korea and the US, it seems logical that the DPRK and China resuscitate their long-standing alliance, despite the many problems and issues they have. Nothing unites as well as having a common enemy. For North Korea, China is the only viable alternative to the US when it aims for successful economic development. One of the most notable changes in the detailed budget figures in 2018 was the share of budget revenue coming from “local areas,” i.e., the provinces and localities, which had dropped significantly compared to previous years. In 2019, the exact same numbers as in 2018 have been reported on the related items, signaling a static situation. In 2018 and in 2019, over-fulfillment of the plan for local budgetary revenue was a mere 0.5 percent, and the share of this source of state income remained at 26.1 percent of total. This is relevant when looking at the reform process of socialist economies in China and in Vietnam, where a shift from central to local economic units has been a key component of the transformation process. The 2019 budget report does not indicate that something like this is currently taking place in North Korea. The first session of the newly elected North Korean parliament brought a number of personnel changes, most notably the replacement of the titular head of state and the prime minister, a post that is important for economic policy. The fact that there was only brief reference to the Five-Year Development Plan in the speeches of the prime minister and the minister of finance leaves room for speculation about economic difficulties. The macroeconomic data and the extensive use of the term “self-reliance” point into the same direction: The North Korean economy is currently undergoing a phase of consolidation. It is not possible to find actual signs of a decline from the SPA documents, but the session also did not provide any indication that the economy is in a dynamic high-growth phase. The reasons for this are subject to speculation and will likely include tightened economic sanctions and unfavorable weather conditions. The biggest political impact can be expected from the newly issued claim of Kim Jong Un, in his capacity as the chairman of the State Affairs Commission, to be the “supreme representative of all the Korean people.” This claim corresponds with the assumption that Kim Jong Un’s long-term strategic goal is to achieve a Korean unification under his leadership. It also seems to imply that he either does not need South Korea’s support as a mediator in negotiating with the United States, or that he does not think South Korea can be useful in this regard. Both would be devastating for the inter-Korean relationship.